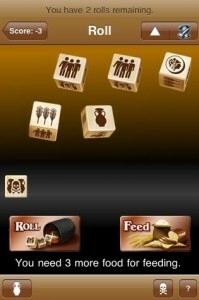 Roll Through the Ages is a bit like Yahtzee meets Civilization. Players roll dice and they can keep the results or re-roll as they wish. After 3 rolls, or if earlier if desired, the player uses their results to hire workers, feed workers, gather goods, build monuments, and develop their civilisation. The goal is to score as many points as possible.